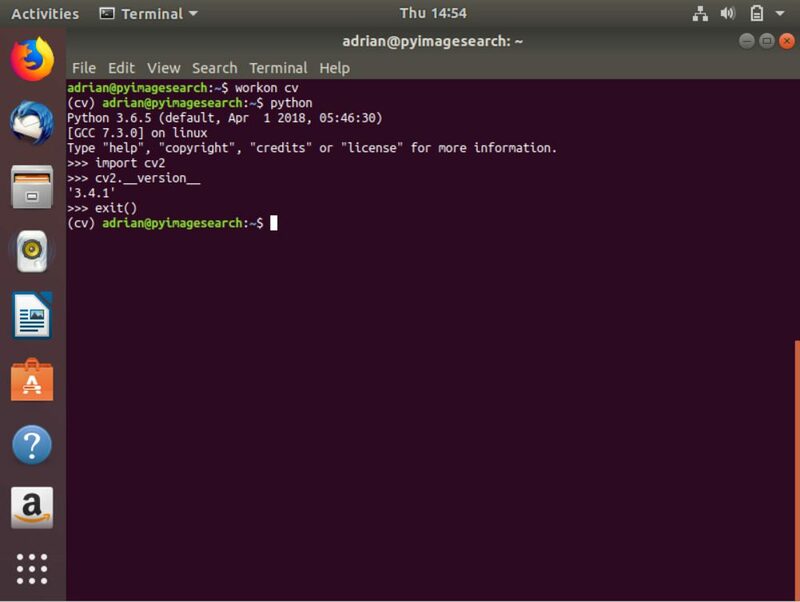 In this blog post you will learn how to install OpenCV on Ubuntu 18.04. The folks at Canonical have been working hard. 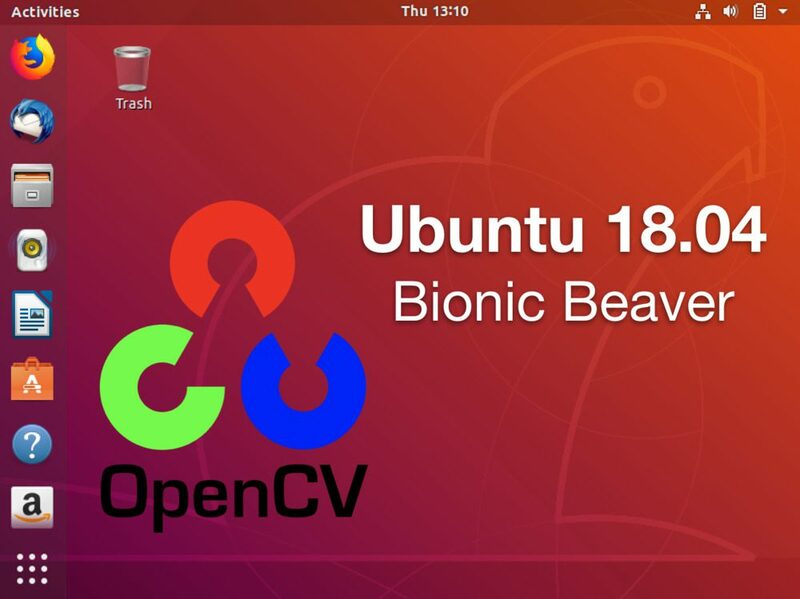 On April 26, 2018, they’ve released a new Long Term Support (LTS) version of Ubuntu for the community: Ubuntu 18.04 LTS (Bionic Beaver). Support for Ubuntu 16.04 LTS continues until April 2021 so rest-assured — you don’t have to upgrade your 16.04 OS to continue working on your image processing projects. That said, if you want to upgrade to Ubuntu 18.04 and use the latest-and-greatest, I think you’ll be quite pleased with the new changes in Ubuntu 18.04. Let’s get down to business and install OpenCV with Python 3 bindings. To learn how to stand up your Ubuntu 18.04 system with OpenCV, just keep reading. Note: While you won’t see an Ubuntu 17.10 specific guide here on my blog (non-LTS), these instructions may work with 17.10 (you’ll just have to proceed at your own risk). One major change in Ubuntu 18.04 is that they’ve dropped Python 2.7 completely. You can still install Python 2.7 if-needed, but now Python 3 is the default on the OS. Given that, this guide supports Python 3. If you need Python 2.7 support, read this entire guide first and then check the first question of the Troubleshooting your install (FAQ) section near the bottom of this blog post for some Python 2.7 pointers. Let’s familiarize ourselves with Python 3 on Ubuntu 18.04. To run Python 3 on Ubuntu 18.04, you must call python3 explicitly. That’s easy enough, so let’s get on with installing OpenCV on Ubuntu 18.04. All steps today will be accomplished in the terminal/command line. Before we begin, open a terminal or connect via SSH. You most likely already have pkg-config installed on Ubuntu 18.04, but be sure to include it in the install command for sanity. OpenCV’s highgui module relies on the GTK library for GUI operations. The highgui module will allow you to create elementary GUIs which display images, handle kepresses/mouse clicks, and create sliders and trackbars. Advanced GUIs should be built with TK, Wx, or QT. See this blog post to learn how to make an OpenCV GUI with TK. Update 2018-12-20: These instructions have been updated to work with OpenCV 3.4.4. These instructions should continue to work with future OpenCV 3.x versions as well. So, what’s the contrib repo? The contrib repository contains algorithms such as SIFT, SURF, and others. In the past, these implementations were included in the default installation of OpenCV 2.4; however, they were moved beginning with OpenCV 3+. Modules that are actively being developed and/or modules that are patented (not free for commercial/industry use) are included in the contrib module. SIFT and SURF fall into this category. You can learn more about the thought process behind this move in the following blog post: Where did SIFT and SURF go in OpenCV 3? Important: Both opencv and opencv_contrib versions must be identical. Notice that both URLs point to 3.4.4. Feel free to install a different version while still using this guide — just be sure to update both URLs. 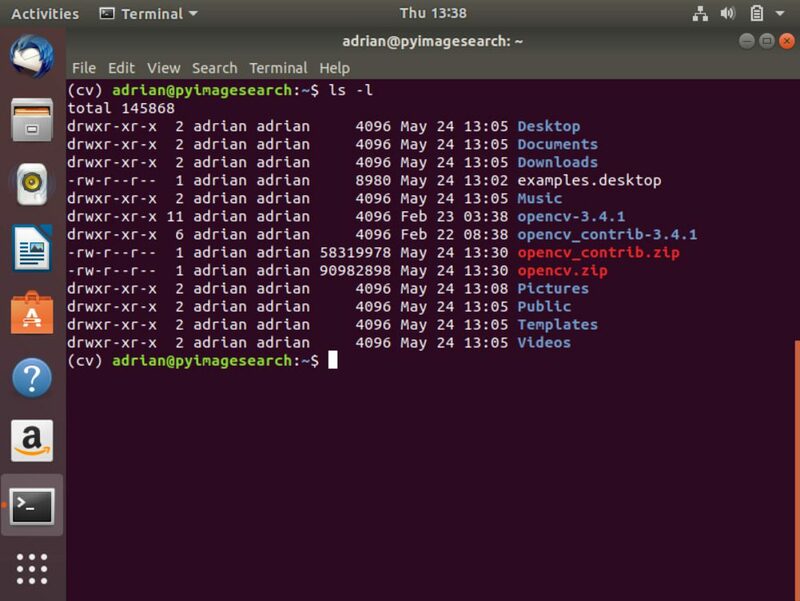 Figure 1: After downloading and unzipping opencv and opencv_contrib, our home directory listing should look similar to what is displayed in the terminal. The first step we’re taking to configure our Python 3 development environment is to install pip, a Python Package Manager. I use both virtualenv and virtualenvwrapper daily and you should too unless you have a very specific reason not to. These two Python packages facilitate creating independent Python environments for your projects. It is a best practice to use virtual environments. Virtual environments allow you to work on your projects in isolation without spinning up resource hogs such as VMs and Docker images (I definitely do use both VirtualBox and Docker — they have their place). For example, maybe you have a Python + OpenCV project that requires an older version of scikit-learn (v0.14) but you want to keep using the latest version of scikit-learn (0.19) for all of your newer projects. Using virtual environments, you could handle these two software version dependencies separately, something that is not possible using just the system install of Python. If you would like more information about Python virtual environments take a look at this article on RealPython or read the first half of the this blog post on PyImageSearch. To finish the install we need to update our ~/.bashrc file. This line simply creates a Python 3 virtual environment named cv . You can name your environment(s) whatever you’d like — I like to keep them short and sweet while also providing enough information so I’ll remember what they are for. You can have as many virtual environments on your system as you’d like! Figure 2: If you see the (cv) at the beginning of the bash prompt, then your virtual environment is active and you’re working “inside” the environment. You can now safely install OpenCV with correct Python bindings. Now we’re moving. We’re ready to compile and install OpenCV. It is very important that the virtual environment is active (you are “inside” the virtual environment) which is why I keep reiterating it. If you are not in the cv Python virtual environment before moving on to the next step your build files will not be generated properly. $ cd ~/opencv $ mkdir build $ cd build $ cmake -D CMAKE_BUILD_TYPE=RELEASE \ -D CMAKE_INSTALL_PREFIX=/usr/local \ -D INSTALL_PYTHON_EXAMPLES=ON \ -D INSTALL_C_EXAMPLES=OFF \ -D OPENCV_ENABLE_NONFREE=ON \ -D OPENCV_EXTRA_MODULES_PATH=~/opencv_contrib/modules \ -D PYTHON_EXECUTABLE=~/.virtualenvs/cv/bin/python \ -D BUILD_EXAMPLES=ON ..
Update 2018-12-20: Be sure to set the OPENCV_ENABLE_NONFREE=ON flag so you’ll have access to patented algorithms that we sometimes review on this blog (and cover in depth in PyImageSearch Gurus). Likewise, be sure to update the path to your virtual environment so that the correct PYTHON_EXECUTABLE will be used (notice cv in the path since our virtual environment name is cv ). I always recommend that you scroll through the CMake output and check to see if anything looks out of the ordinary. You won’t see a “YES” marked next to every setting — that is normal. Be sure you don’t see any errors or your compile may fail (warnings are okay). 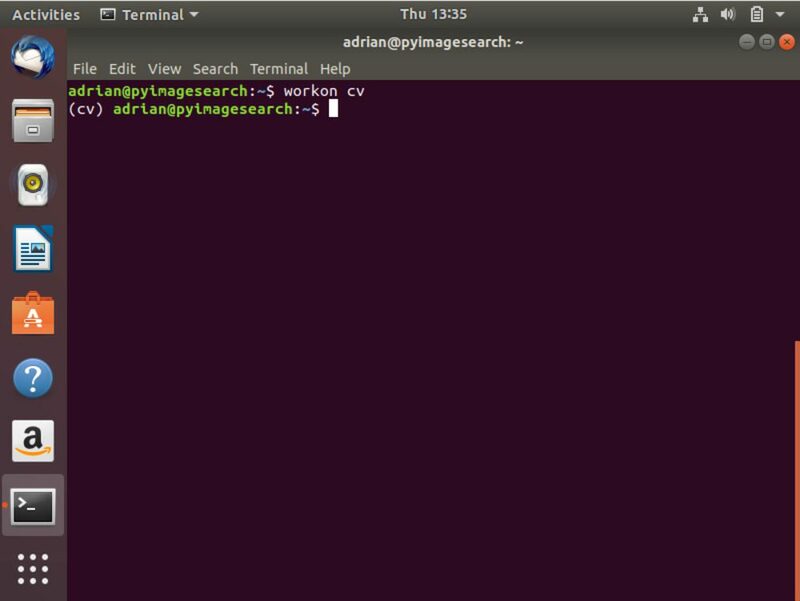 Figure 3: To compile OpenCV for Ubuntu 18.04, we make use of CMake. The CMake tool will configure settings prior to compilation. Take a moment to notice that only “Python 3” section is shown in the CMake output on Ubuntu 18.04 in Figure 3. This is by design as we are only compiling OpenCV with Python 3 support. Update 2018-12-20: Additionally, scroll up about 20 lines and make sure “Non-free algorithms” is set to “YES”. Note: If you are encountering problems related to stdlib.h: No such file or directory during either the cmake or make phase of this tutorial you’ll also need to include the following option to CMake: -D ENABLE_PRECOMPILED_HEADERS=OFF . In this case I would suggest deleting your build directory, re-creating it, and then re-running cmake with the above option included. This will resolve the stdlib.h error. Let’s compile OpenCV using make . Figure 4: To compile OpenCV with Python 3 on Ubuntu 18.04, we use make. Using make compiles OpenCV from source and is preferred over using package managers for installing OpenCV. This process may take 30 minutes or longer, so go for a nice walk if you are able. If your compile chokes and hangs, it may be due to a threading race condition. In the event you run into this problem, simply delete your build directory, recreate it, and re-run cmake and make . This time do not include the flag next to make . We’ve reached the last lap of the race so stick with it. Update 2018-12-20: The following paths have been updated. Previous versions of OpenCV installed the bindings in a different location ( /usr/local/lib/python3.6/site-packages ), so be sure to take a look at the paths below carefully. Pro-tip: If you are installing OpenCV 3 and OpenCV 4 alongside each other, instead of renaming the file to cv2.so, you might consider naming it cv2.opencv3.4.4.so and then in the next sub-step sym-link appropriately from that file to cv2.so as well. The race is done, but let’s verify that we’re firing on all cylinders. Figure 5: To verify that OpenCV is correctly installed and configured in our Python 3 virtual environment, I like to run the Python interpreter in the terminal. From there you can import OpenCV (cv2) and verify the version number matches what you intended to install. Update 2018-12-20: I did not update the screenshot today during my update. The version should reflect the version of OpenCV you installed. In this section, I address some of the common questions, problems, and issues that arise when installing OpenCV 3 with Python 3 on Ubuntu 18.04 LTS. Q. Where is Python 2.7 on Ubuntu 18.04? From there everything should be the same. Q. Why can’t I just pip to install OpenCV? A. There are a number of pip-installable versions of OpenCV available depending on your operating system and architecture. The problem you may run into is that they may be compiled without various optimizations, image I/O support, video I/O support, and opencv_contrib support. Use them — but use them at your own risk. This tutorial is meant to give you the full install of OpenCV on Ubuntu 18.04 while giving you complete control over the compile. Q. When I execute mkvirtualenv or workon , I encounter a “command not found error”. First, make sure you have installed virtualenv and virtualenvwrapper properly using the pip package manager. Verify by running pip freeze , and ensure that you see both virtualenv and virtualenvwrapper in the list of installed packages. Your ~/.bashrc file may have mistakes. View the contents of your ~/.bashrc file to see the proper export and source commands are present (check Step #3 for the commands that should be appended to ~/.bashrc ). You may have forgotten to source your ~/.bashrc . Make sure you run source ~/.bashrc after editing it to ensure you have access to the mkvirtualenv and workon commands. Q. When I open a new terminal, logout, or reboot my Ubuntu system, I cannot execute the mkvirtualenv or workon commands. A. See #2 from the previous question. Q. When I try to import OpenCV, I encounter this message: Import Error: No module named cv2 . Make sure your cv virtual environment is active by using the workon cv command. If this command gives you an error, then see the first question in this FAQ. Try investigating the contents of the site-packages directory in your cv virtual environment. You can find the site-packages directory in ~/.virtualenvs/cv/lib/python3.6/site-packages/ depending on your Python version. Make sure (1) there is a cv2.so file in the site-packages directory and (2) it’s properly sym-linked to a valid file. Be sure to check the site-packages (and even dist-packages ) directory for the system install of Python located in /usr/local/lib/python3.6/site-packages/ . Additionally please check /usr/local/python/cv2 . Ideally, you should have a cv2.so file in one of those locations. As a last resort, check in your build/lib directory of your OpenCV build. There should be a cv2.so file there (if both cmake and make executed without error). If the cv2.so file is present, manually copy it into both the system site-packages directory as well as the site-packages directory for the cv virtual environment. The possibilities with OpenCV are truly endless. Figure 6: We can use OpenCV to track the motion of objects in real time! 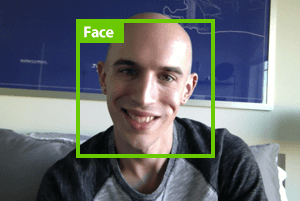 Or maybe you’d like to use OpenCV + deep learning to detect faces in images/video? Trust me, it’s easier than it sounds! Figure 7: Detecting faces in realtime with OpenCV is easier than it sounds. 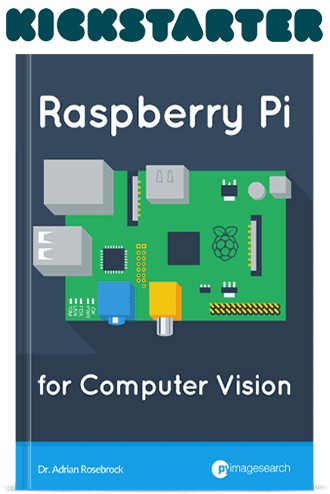 Or maybe you’re looking for a beginner-level book, designed for newcomers to the world of computer vision? 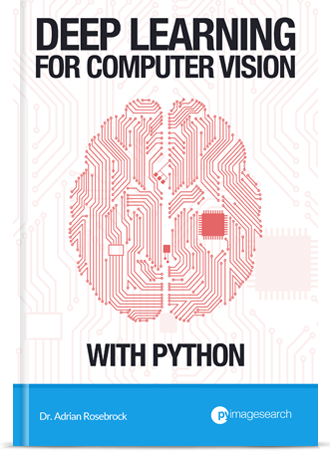 If so, look no further than my book, Practical Python and OpenCV + Case Studies. 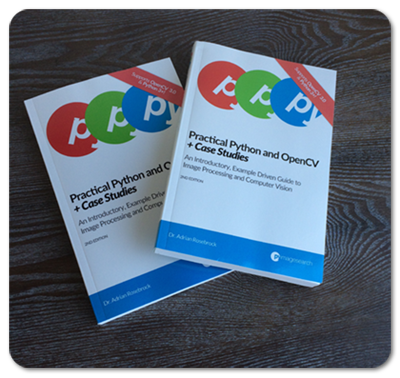 Figure 8: Practical Python and OpenCV + Case Studies is a book meant for beginners but it is also useful for those that want to solidify their knowledge of the fundamentals. Be sure to give it a read! Master the fundamentals of computer vision and image processing, taught on a fun, hands-on manner. Learn by doing, including visual examples and lots of code (including line-by-line reviews, ensuring you understand exactly what’s going on). Implement case studies, including face detection, object tracking, handwriting recognition, and more! 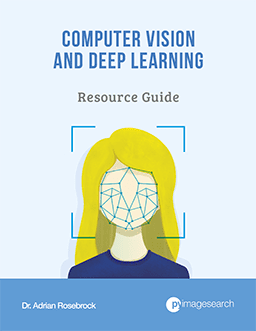 To learn more about the book (and how it can help you learn computer vision + OpenCV), just click here! Today we installed OpenCV 3 with Python 3 bindings on Ubuntu 18.04 LTS. I hope you found these instructions helpful on getting your own Ubuntu 18.04 machine configured with OpenCV 3. If you’re interested in learning more about OpenCV, computer vision, and image processing, be sure to enter your email address in the form below to be notified when new blog posts + tutorials are published! Hi Adrian! Is there a certain reason why you don’t clone the OpenCV repo instead of fetching as an archive? You could do either, but downloading the official release archive tends to be easier for those who are not used to installing and configuring OpenCV on their systems (less commands to execute hear typically means less chance of causing a problem). If you cloned down the original repo the download would take longer and you would have the added step of checking out the specific release. Hey Adrian, thanks for another awesome guide. Is it possible to use conda (instead of pip) in the above guide? You should be able to but I haven’t tested with Anaconda (I’m not an Anaconda user). The most important part will be during the “cmake” step where you’ll want to make sure your “Python 3” libraries, interpreter, etc. point to your Anaconda version, not your system version — this is a mistake I’ve seen others make. Could you be more specific about the cmake step for Anaconda users? I followed your kind instruction and compiled successfully, but I don’t see site-packages created and assuming this is because I have Anaconda version of python. How can I appropriately make sure python 3 libraries, etc point to my Anaconda version? Hey Anthony — I don’t have any systems with Anaconda installed so I unfortunately cannot provide you with an example cmake command as I do not have the directory structure you would. The closest example I would have is this somewhat related tutorial on installing OpenCV on macOS. Inside the tutorial you’ll see that I set the PYTHON3_LIBRARY and PYTHON3_INCLUDE_DIR values. You will need to do the same for Anaconda. Hey Adrian, thanks a lot for another awesome tutorial! 1. I’m not sure what you mean. Are you asking for specific deep learning library install instructions? 2. I am not aware of any compatibility issues but I also haven’t performed exhaustive experiments on Ubuntu 18.04 either. Ooops, I can see your recommendation to stick to 16.04 for deep learning, sorry. When it comes to deep learning environments, if it’s not broken, don’t fix it. Ubuntu 16.04 is perfectly legitimate for deep learning work. I would not be chomping at the bit to immediately switch to Ubuntu 18.04 for deep learning unless there was a very specific reason for doing so. Hello Adrian! I have a question about the new Ubuntu release. Have you been using Ubuntu 18.04 for deep learning? I’ve installed it and I’m planning on using TensorFlow and MXNet with GPU support enabled, but I’m afraid I was too eager to try the new release and didn’t think about the lack of support for those packages since 18.04 is too new. Should I have sticked with 16.04? Or are TF and MXNet already good to go on 18.04? As far as deep learning goes I would recommend sticking with Ubuntu 16.04 for the time being. Ubuntu 16.04 is more “mature” in terms of support of deep learning libraries. Keep in mind that Ubuntu 18.04 is essentially brand new and would be more likely of encountering issues. Deep learning libraries change rapidly though so I wouldn’t get too concerned about it if you’re already on 18.04. Why do not you use pip install opencv-python ? This article is excellent as always and timely for me, as I spent the last few days making opencv3.4.1 with dnn_modern and python 2.7 and 3.6 libs in a ubuntu16.04 docker. The long build time you noted above – combined with my copious mistakes insured many joyous repetitions of the cmake/make bits, until I got the opencv cmake build options just right. (And I needed? to build python cv libs and load them before I could see if they could find all their shared libs, in turn.) I’ve tried virtualenv but it was just too easy for me to break my ubuntu desktop with it. The docker approach seems to make up for my sloppiness with virtualenv. I often need a bib when I eat, though, so that might be a pattern..
Congrats on getting OpenCV installed on your Ubuntu system, Doug! I agree that Docker is a good use case here. Your rational for finding it too easy to break your main system is part of the reason why I really like cloud-based systems. Configure it once, snapshot it, and then delete + spin up a new instance if you ever break it! Really enjoying what you are putting out into the community. Those optimizations are for ARM processors. Most Ubuntu users will likely be on non-ARM chipsets. If you are installing Ubuntu + OpenCV on an ARM processor you can of course use them. Everything seems to be working for me with Anaconda 3.6 and Linux Mint 18.3 Cinnamon 64 bit with installing/using the deep learning libraries..
I’ll be honest, I don’t know much about Linux Mint so I don’t think I’m qualified to say whether you should be using Ubuntu over Linux Mint. That said, I Ubuntu is often used for many deep learning projects and it’s very user friendly. I would recommend it if you are using Linux systems. Thanks, Adrian. This is a very good tutorial for me to implement opencv on my new computer. I have a question now, how can I work in jupyter notebook and use this cv virtual environment. Thanks very much. Iḿ having trouble sinvce I can find my site-packages folder in the path you say, there is only the dist-packages directory in that path. I don’t know where to look for it or if it is suposed to be only there. I’m not sure why you would not have a site-packages directory and only a dist-packages directory. They should both be in the same subdirectory. Which step are you on? If the “make install” worked you should check your “dist-packages” directory for the “cv2.so” bindings instead. I Have the same issue as well. @Andres did you find any solution or path to .so file? I had the same problem on a clean VM. Delete you build directory and make it again from step 4. You will have the site-packages folder after this and the cv2.cpython-36m-x86_64-linux-gnu.so file. F.Y.I. I have no idea what I am doing. I just googled the answer and this worked. – deleting “build” directory and starting again from step 4. OpenCV changed the install process slightly for OpenCV 3.4.4. When you run “make install” the make script bundles together all OpenCV + Python bindings in /usr/local/python/cv2/python-3.6. Previous versions of OpenCV did not do this. It looks like Adrian made these updates today (based on a few “Update 2018-12-20” notes in the post. Thanks Adrian! I have changed to Ubuntu 16.04 since im going tu use DNN and it seems is more reliable in that version, I have a doubt about CUDA integration with my project because I’m having trouble integrating the library in opencv, since im going to use tensorflow which one is better to compile CUDA with? or i will need it with booth of them? You can use OpenCV with CUDA but it really depends on what you are doing. If your goal is to be developing DNNs you should install TensorFlow/Keras with CUDA support. OpenCV can be used to make predictions with some DNNs but for training you should be using TensorFlow/Keras. Thank you for sharing, Anand! can you help me on that ? the log file is too long i can’t post it here. Can you create a GitHub Gist and link to it? Looking at your cmake output I don’t see any issues. Your “Python 3” section is correctly filled out and your build files have been generated. Keep in mind that many OpenCV configurations are optional. Just because cmake reports “not found” doesn’t mean it’s an error. You should be able to go ahead and compile OpenCV. Oh man, I imagine trying to install OpenCV 2.4 on Ubuntu 18.04 would be quite a pain. It’s a hack but you may want to consider installing a VM with a much older version of Ubuntu 10.04/12.04 and then following the instructions from a previous previous Raspbian tutorial (Ubuntu and Raspbian are both Debian based). I do not know offhand what changes would need to be made for this tutorial and OpenCV 2.4 but I imagine there would be a few, mostly related to the specific apt-get packages installed. Best of luck with it! Might be too late now, but if you use Anaconda, you can install OpenCV 2.4.2. It probably won’t have all of the bells and whistles like this full installation, but it should get you going. After following instructions, to specify here, I found that contrib modules, while being built, weren’t actually getting installed… after digging around, found that you need to modify the cmake command where the extra modules are specified, to add a target for them. This then allowed me to use the contrib modules for a few things that I was also compiling in C++. The “Python (for build)” section is buggy and will not be correctly filled in. Ignore it. As long as your “Python 3” section is properly filled in you’ll be able to build the OpenCV bindings. Hi Adrian, here’s the thing: the Python 3 part is missing from the terminal output, which only shows Python (for build), even though I followed the instructions in the same order. Additionally, the cv2.cpython-36m-x86_64-linux-gnu.so is missing (in fact, the site-packages folder itself was missing.) Could those two errors be related, and if yes, what would be the way to fix them? If the “Python 3” section is missing entirely then your .so bindings will not be built. Make sure you are in your Python virtual environment before running “cmake”. Hi Adrian, i’ve followed your steps like a recipe book, but i have no idea why my Python (for build) is NO after finishing the cmake. i’ve tried other methods but it isn’t working. sorry i got it to work already. Congrats on resolving the issue, Jeremy! Just setup Ubuntu 18.04 and your blog post email popped up in my inbox, amazing 🙂 ! Sort of a side question, I’ve recently stumble across “pipenv” for setting up pip virtual environments, was wondering have you tried it and would love to hear your comments! I’ve played with pipenv on one system but I personally haven’t put it through the ringer yet. I still really like virtualenv. If you follow the instructions on this post you will have the C++ OpenCV installed as well. As far as your CMake errors go I cannot provide any suggestions without knowing what your error is. Your clear and straight-up tutorial worked for my Thinkpad P71, even after I installed ubunutstudio 18.4 next to Windows 10 Pro. No errors (a total rarity for me)!! Where do I find examples? Congrats on getting OpenCV installed on your system, that’s great! The PyImageSearch blog includes 250+ (free) tutorials on how to use computer vision and OpenCV in projects. 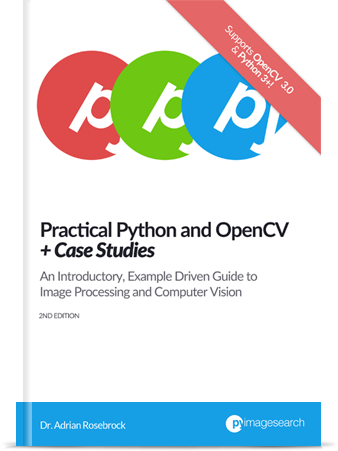 If you are looking for a more structured, linear path to studying OpenCV I would recommend my book, Practical Python and OpenCV as well as the PyImageSearch Gurus course. I don’t know how to configure and install the OpenCV in ubuntu. But after reading the post now I can install it in Ubuntu. I also need to install python for using the OpenCV. 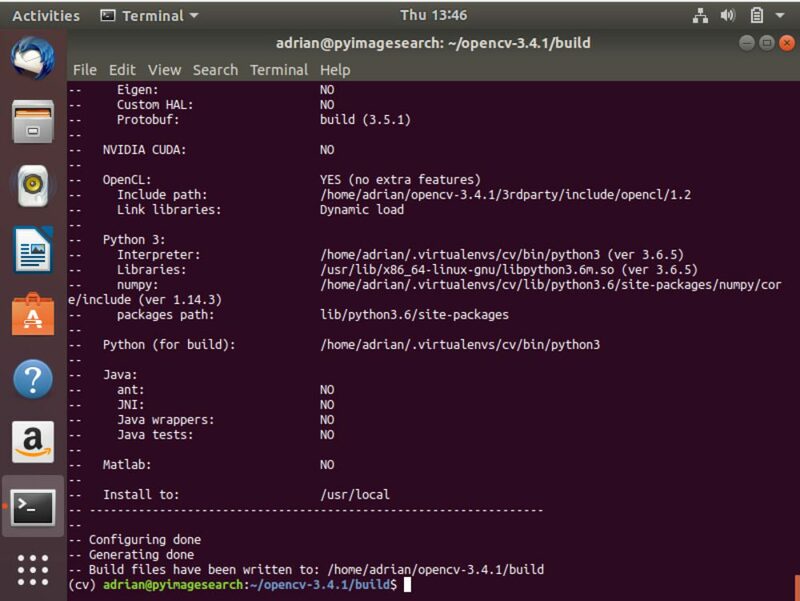 The method detailed in this post will show you how to install Python and OpenCV on your Ubuntu system. This of course assumes that Anaconda was installed in the default location. I put all of your instructions into a script, but I have not tested it. Thank you clamytoe. This helped me to compile for Miniconda3 on Ubuntu 18.04. Thanks Adrian and Clamytoe. This worked on Ubuntu and Anaconda environment. Seems like it was some problem in the cmake part. I repeat the entire process and now it seems ok.
I’m glad it worked for you Javier! Thanks, Adrian for this guide I was able to build OpenCV using cmake params. Thank you for sharing, Abdulrhman! hey how exactly are you supposed to edit the ~/.bashrc if workon command is not found? which part are you supposed to change? and if i chose not to use virtual, then what should i change? You can use your favorite text editor to edit your .bashrc file. As far as changing it goes, without knowing what commands you’ve run on what errors you’ve encountered it’s hard for me to give any suggestions. Try to ensure your .bashrc file matches what I’ve included on the PyImageSearch blog. If you choose to not use virtual environments you can skip all ‘workon’ and ‘mkvirtualenv’ commands. All I have found is a dist-packages folder. Have you solved the issue yet? Hey Jacob, no need to submit three comments to the same post. I went ahead and removed the first, redundant one. If you have a “dist-packages” directory, which it sounds like you do, you can use that one instead. This tutorial was not designed for Anaconda. I would suggest using my exact install instructions. I compiled opencv 3.4.2 (I need it for your saliency-detection post 🙂 ), I follow your detailed instructions step by step and it works like a charm. Great tutorial It saved me another painful nightmarish experience compiling opencv again…. How can I launch idle Python in a virtual environment? Unfortunately you cannot. Python IDLE does not respect Python virtual environments. You should look into using Jupyter Notebooks instead. I had an issue at compile time with xfeatures2d. It threw a fatal error about a missing file “fatal error: opencv2/xfeatures2d/cuda.hpp: No such file or directory”. I solved it with a brute force approach: removing xfeature2d directory from contrib modules “rm -rf ~/opencv_contrib-3.4.1/modules/xfeatures2d/”. Maybe not the best way to solve the problem, but it compiles now. I suppose that xfeatures2d is needed for SIFT/SURF algorithms, so don’t remove this module unless you are not planning to use them! Conflicts occur with Yolo v3. After googling it seems that it is better installing 3.4.0, but still not succeeding in compiling darknet yolo v3 with opencv. Anyone? Just to clarify, you’re compiling DarkNet from source but OpenCV itself installed okay? I did follow the instruction without any problems. Can you check and see if it’s in the build/lib directory? If so, you can manually copy it over. Hello, sir thanks for your tutorial, what if i want to develop using CUDA? Do i need to do it on C++? can you please assist with the set up for CUDA please? You can follow my guide on compiling OpenCV with CUDA support. Excelent! I followed all the steps and it worked, Thanks! There’s no site site-packages in my 3.6, there is in 2.7 but it’s empty. First I had problem with not having /site-packages/ -folder, but I figured out I need to be installing opencv inside that virtualenv cv. (using ‘workon cv’) and then it worked fine. Second problem came, when I didn’t have ~/.virtualenvs/ -folder. It was located in root (/), not at home (~), which confused me when trying to link the cv2.so files. But linking to there it worked. Hey Jho — it sounds like you may have accidentally ran all these steps in a root shell versus a user shell, that is likely what the discrepancy is. Which problem is that, Beckyli? 2) It found the python interpreter I gave but at the end I cannot find the .so file you mentioned. I do not have the site-packages folder anyway but rather a dist-packages one. 3) As I cannot do the linking of the bindings then I cannot use open cv in the virtual environment. 1. As long as you are in the “cv” Python virtual environment your Python libraries and include dirs should automatically be found cmake. You can pass them in manually but that should be unnecessary. 2. You need the entire section filled out correctly, not just the interpreter. The include dirs, libraries, interpreter, and NumPy sections need to be filled out. I tried using the additional option -D for No such directory or file but it doesn’t seems to work as I am getting same error with or without additional -D option. If you can help it would be really great. You’ll want to scroll up through your “cmake” output to find out exactly what the error is. The error you’re reporting in the comment is just a message from cmake saying the build files could not be created — the actual error is farther up in the output. There is a typo in the line “cmake -D CMAKE_BUILD_TYPE=RELEASE \”. It should be “cmake .. -D CMAKE_BUILD_TYPE=RELEASE \” because the previous command was “cd build”. I was wrong. There is “..” at the end of the command. That’s what the problem is there is no output or anything just the error the build doesn’t even gets started. I even tried to start from scratch like setting up the vm again but still the error remains same. Are you sure you’re in the “build” directory when you execute the “cmake” command? It almost sounds like your directory structure is incorrect. Delete the files and restart from where we download the OpenCV source code to our system. How can i add .virtualenvs on my pycharm ide?i mean how can run program terminal & pycharm in both side? You’ll want to go to your project preferences and set then the “Python Interpreter” to point to whatever Python virtual environment you are using. Please can you tell me/us ho to include GStreamer support in the opencv installation ? Are you aware that we need to add this switch in CMAKE now to get the “non-free” modules ? Thanks Patrick, I’ll check on this. When compiling OpenCV with ‘make’ I run into the error “unsupported GNU version! gcc versions later than 6 are not supported!”. I’ve tried reading online where I could perhaps use an earlier GNU version with no success. Could you please assist? If you’re new to Linux I would actually recommend a simple pip install of OpenCV. It will be faster and easier for you. Give it a try, I think it will help. Okay I’ll give it a go. I appreciate the help. I’ll actually be publishing a new tutorial on Ubuntu 18.04 + CUDA for deep learning in the next couple of weeks. The steps to install are similar but there are a few things to watch out for. However, I’m getting the following error when attempting to run one of your examples.. I am unable to find cv2.cpython-36m-x86_64-linux-gnu.so in any of the directory. I am using Linux Mint. What version of OpenCV are you trying to install? Sorry, that’s not entirely true and will lead you to trouble. If you would like install OpenCV via pip you should see this guide instead. Keep in mind that you are not installing any of the “contrib” packages which you should do if you plan on OpenCV. But, even if you do perform a pip install of OpenCV you won’t have access to the NONFREE modules which this blog post demonstrates how to do. Keep in mind that the two are not the same. Then I used pip3 and didn’t get the error. Is that something you need to update or was it something that I did wrong? Double-check that your .bashrc file updates match mine inside the post. Provided you can run “source ~/.bashrc” without an error you should be okay. Thank you so much for this great blog. This saved me!! Before I saw this I had installed Ubuntu 18.04 under a Windows subsystem for Linux on my Windows 10 system along with the virtualenv and virtualenvwrapper. I was stuck on installing OpenCV and tried several pip and get-apt approaches. Your blog saved me. I followed the steps for the CV2 build and install and it seems to all be working now. Thanks for the kind words, Brian! And congratulations on getting OpenCV installed on your Ubuntu system! I have a problem, I have Ubuntu 18 running on an odroid and when I try to install opencv but it’s not possible because it can’t find jasper libs for this Ubuntu. thanks for the useful tutorial. I am a novice in work with image and video but it is not a convinced reason to my proffesor for not handing in the project on time. I have used this app face-recognition ” https://github.com/ageitgey/face_recognitionhttps://github.com/ageitgey/face_recognition“. I applied ubuntu 18.04 and use camera of laptop to implement this project. I have already installed dilib, cmake and open cv to detect and recognized faces on a realtime video. unfortunately I faced two problems that I have no idea about how I can solve it. I want to write a code in order to write the time and date which camera recognize the face of that person. I wanna create a database or a folder which contains face of the recognized person with the time and date. I know that you are busy but I think you are so generous to spend your time to give me a tutorial which contains the code that has the ability to show the time and date. I am really looking forward to your answer. You can obtain the time and date of a recognition via the “time” or “datetime” Python modules. But it is possible to remove virtualenv after installation? Technically yes, but I don’t recommend that as Python virtual environments are a best practice. That said — once the “cv2.so” bindings are in your system “site-packages” directory you could technically remove the virtual environment (NOT recommended). Thanks for , such a great tutorial for installing opencv3.4.4 on Ubutnu 18.04.
followed every step as you suggest. I am accessing my aws ubuntu server using ssh on window 10 (laptop dell having front camera) and trying to access camera using VideoCapture(-1) function.but getting error (VIDEOIO ERROR: V4L: can’t find camera device). Please suggest what i am missing . i also enable x11 forwarding in ssh. As far as I understand the “-1” option is not yet fully supported in OpenCV. You need to specify the index value via “0”, “1”, “2”, etc. Also, I’m a bit confused regarding your setup. Are you streaming the feed from your laptop to the AWS server? Following your steps, when I get to the CMake part, niether python2.7 nor python3.5 show up. I have no idea what im doing wrong, any help would be greatly appriciated! If its of importance I am using Raspian Lite. Make sure you are inside the Python virtual environment before executing “cmake”. how i can to import cv2 module from python idle? Python IDLE does not respect virtual environments. If you really want an IDLE-like environment you should use Jupyter Notebooks. cmake -D CMAKE_BUILD_TYPE=RELEASE \ -D CMAKE_INSTALL_PREFIX=/opt/opencv \ -D INSTALL_PYTHON_EXAMPLES=ON \ -D INSTALL_C_EXAMPLES=OFF \ -D OPENCV_ENABLE_NONFREE=ON \ -D OPENCV_GENERATE_PKGCONFIG=ON \ -D OPENCV_EXTRA_MODULES_PATH=~/opencv_contrib-4.0.1/modules \ -D PYTHON_EXECUTABLE=/opt/anaconda3/envs/OpenCV/bin/python \ -D BUILD_EXAMPLES=ON ..
opencv4.pc file should be generated in …/opencv/lib/pkgconfig/ directory. Hi Adrian, the guide was thorough but i am facing issues in ‘cmake’ process. After executing the command as it is, the output was inconclusive and did not ended as it should according to guide. Please try and solve my problem as soon as possible. Hey Raj — without knowing more details I honestly don’t know what the problem would be. You might want to try a simple pip install and see if that works for you.